I’ve had a few things not quite right with my sleep apnea CPAP therapy the last few weeks. First, my AHI has crept up from an average of about six to close to eight – about a 30 percent hike. Second, my Fisher & Paykel Simplus mask seemed to be leaking more than it normally did no matter how much I tightened it. Finally, the header on the Simplus started to have some material issues. With all of that going on, I took a trip to my CPAP equipment provider to discuss the situation with the mask and see if we could find some kind of solution or remedy. The Simplus mask that I was using was only about six weeks old, so it wasn’t like I’d been using it for a year or so which made the whole situation even odder. Over the last week of using it, I started noticing that the silicone seal had become a bit looser and “gummier”. The looseness was also exactly where I was getting leaks. What seemed to be happening is the air pressure on the seal was causing it to blow out when pressure would increase while I slept and was having events. My theory was, these little leaks were causing me to wake up slightly and adjust my mask in a half-conscious state and exacerbating the number of hypopnea and apnea events I was having, thus explaining the increased AHI. The headgear issue was a bit more troubling, not from a CPAP therapy perspective, but purely from the quality of the product I’d bought. The mask tightens by ways of six velcro straps: two on top of the head, two on the forehead and two on the side by your cheeks and under the ears. The straps on the cheeks started having real problems. The Velcro adheres directly to the material of the headgear, but what started happening was the actual material started peeling away from the foam structure underneath. The obvious problem here is that the straps are longer secure, they float around as the material peels away from the underlying structure of the headgear. I wish I had taken pictures, but I forgot. My CPAP equipment provider said she’d never seen anything like the problem with the headgear before and it was something she was going to keep an eye on. She pointed out something I’d not noticed, a slight discolouration of the fabric where it was peeling away. I thought perhaps it was sweat or something, but it was on the outside, not the underside where it came in contact with my skin. I told her that it looked like the industrial glue that they use to adhere the material to the underlying foam structure of the headgear may have liquified and broken down causing the material to come away. The issue with the silicone was also something she’d not seen in such a new mask. She really had no explanation for that one. My provider then immediately called the Fisher & Paykel sales rep they use, explained the problem and the sales rep immediately told her to do a full warranty replacement of the entire mask and headgear. 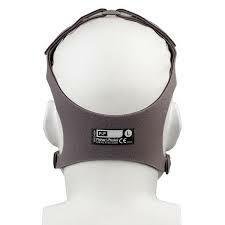 I’ve now used the CPAP mask replacement for a few nights and I’ve noticed straight away that the headgear is “stiffer”. My original CPAP mask was right out of the package as well, but the headgear was loose and malleable. I don’t really have an explanation, but the new mask’s headgear just seems to be better constructed, we’ll have to see how long it lasts. Have you ever had your CPAP mask or headgear fail or deteriorate within a few weeks of using it? I’d like to hear about your experiences, so please feel free to post a comment below. Hi. I use the simplus mask and headgear as well and the actual mask is fine, but the headgear is a real problem. I am on my second lot of headgear. The foam breaks away and makes trying to get a nice tight fit very difficult. I’ve read other stories on the net about the same headgear. Luckily F&P have been good about it as has my own technician. I just hope they come up with a solution because it’s frustrating. The headgear has been diabolical on the Simplus – I went through 4 sets from July through early November. Last week when I took the fourth set back to be replaced my supplier and the day before they had received a “new” version of the headgear from F&P. The latest version of the headgear is exactly the same, but it looks like the microfibre has been sealed all the way around and the stitching holding the foam together has been doubled or tripled in thread count. The Eson nasal mask has the same headgear as the Simplus but the feedback has been that it isn’t having the problems the Simplus were having. The technician showed me the Eson headgear and it was now the exact same as the new Simplus headgear she gave me. The new headgear for the Simplus is much improved. I’ll probably do a blog post about it, but my AHI has cut in half since switching to it. I’d call your tech and see if they have the updated version of the headgear in stock. Hi, I just recently went on CPAP a week and a half ago, I also liked the FP new Full face Simplus from the first try, and that’s what I purchased. It worked great, no leaks and no headgear problems, but one week last friday, which made it exactly one week of using the mask, in the middle of the night it started leaking heavy into my eyes and hissing loudly, I thought it got loose, I tried to tighten it up a bit but did not work. In the morning I discovered that right in the thin section that goes over the bridge of my nose was ripping. Does this mean that using these CPAP masks is going to be a continuous expense, it cost me €155.00 for this mask and it only lasted a week? Of course I’m on my way to the supplier as it does say that there is a 90 day Warrantee. But then again 90 days is only 90 days! That’s unfortunate about the tear in the silicone. I was talking to a gentleman at my CPAP supplier’s office a few weeks back and his wife tore his seal cleaning it with her wedding rings on – a jagged edge tore the very same part you’re talking about. I wash my mask entirely by hand using baby shampoo and I don’t wear any jewellery when I do, I even take my watch off. I could conceivably see how you may actually do that inadvertently in your sleep as well, I sometimes find myself poking down the top of the nose to scratch myself. It could also just be a manufacturing problem with that particular mask under pressure. At least they’re replacing it. Let us know how you go with the replacement and if it happens again. Good luck! I do not wear any jewelry or a watch, I also hand wash the mask with very mild soap in lukewarm water. Since it happened while I was asleep, I could not say what did it, but something had to trigger it. The good news is that the supplier replaced the mask with no questions, and also encouraged me to contact him again in the case where I experience any problems in the future. He told me that a mask has an average lifespan of a year. Which really was my main concern, as such items are very expensive here in Malta as the population here is small and volume pricing is non existent here. In any case I am looking forward to a good night sleep. You know in the ten days I have been on a CPAP machine, I am certain that I have not yet felt it’s full benefits, but one thing I have noticed is that when I look in the mirror my skin looks much healthier. Thank for sharing and Shalom.